I've talked before about some of the supplements I take (for thyroid and brain function), but it's been a couple of months and I wanted to do an update! This is basically a journaling activity for me to see where I'm at and catalog any developments in my supplement routine, but I also wanted to put the information out there so that others can see what works for me. When necessary (every few weeks or especially if my immune system is weak, or I've had to take antibiotics), I take a 50 billion-count probiotic from Now Foods. You can also see from the picture above that I've been using some form of whey protein as an exercise aid, and have been transitioning into using it only grassfed sources. I don't do any multivitamin because I want to get most of my vitamins and minerals from my food, and I can't ensure the quality of the ingredients I'm getting. 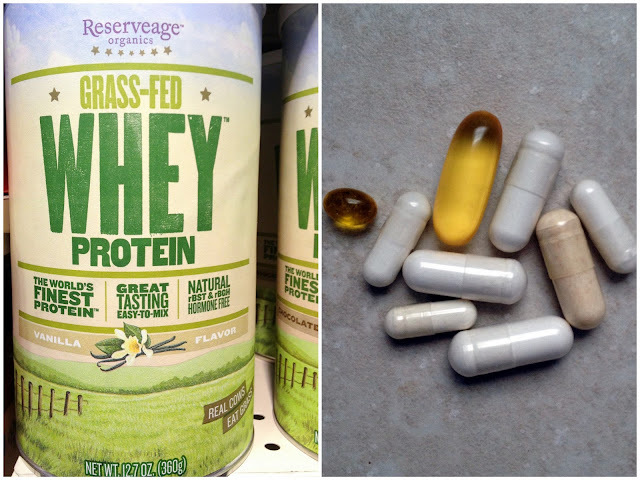 I also want to take a targeted approach and only take supplements that I know are hard to get enough of in my diet, or having a surplus would be beneficial. These are some of the supplements I've been taking and continue to take while others have fallen by the wayside. I find them to be an important part of my overall health regimen. I get most of my nutrients from food, but to optimize my body and brain to the highest degree possible I've added some of these supplements in a targeted way. I'll check back in on this topic in a couple months after further revisions and testing of new additions. do you have any recommendations for a fish oil that doesn't leave the gross fish after taste? Yes! I really like the Nordic Naturals brand. It's infused with a lemon flavor to prevent that fishy taste from happening. Optionally, you could try taking it with a meal to help lesson that fishy aftertaste. Let me know how that works! Thanks for posting this, I was needing to get some Folate as I am treating my thyroid issues. Vitamin D Optimization: Sunlight or Supplements?